On this first episode of The BusinessWise TV Show, host Arte Maren demonstrates the Hubbard Administrative Scale of Importance. The Administrative Scale or Admin Scale is a basic principle of the Management Technology developed by L. Ron Hubbard, initially to assist the Church of Scientology in its world-wide expansion. When learned well and applied, this information on the Administrative Scale will enable you to attain literally any goal, large or small. This is also called the Scale of Importance and Mr. Maren gives definitions and examples of how to use it in ones own business or life. On this episode of BusinessWise TV, host Arte Maren interviews entrepreneur Pat Clouden about the tool he uses to eliminate ups and downs in his businesses. New Episode of BusinessWise TV Online Now! "Your Staff is Your Most Important Resource"
On this 4th Episode of BusinessWise TV, Arte Maren interviews Dr. Charles and Marina Simon about how they successfully built and run six practices remotely. On this third episode of The BusinessWise TV Show, host Arte Maren Interviews Executive Training Expert, and Founder of MGE Management Experts, Luis Colon. On this second episode of The BusinessWise TV Show, host Arte Maren Interviews Direct Mail Marketing Expert, and Founder of PostcardMania, Joy Gendusa. 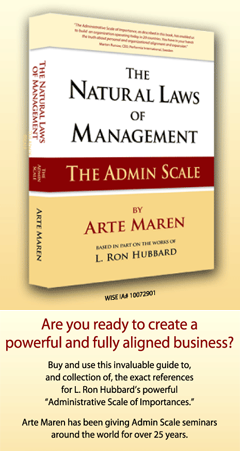 On this episode of BusinessWise, host Arte Maren demonstrates the Administrative Scale of Importance. Very well done! Excellent production, delivery, data and explanation. 1. Come-on at the end: Something like, “Now, maybe you´re thinking that, well, I´m always planning how to make things better, and it doesn´t seem to really get me anywhere. Times are tough! That´s true. In our next program we´re going to be going over how to plan and program to avoid the pitfalls and REALLY move your business to the next level. Don´t miss it! Thank you for this. It is very well done. Excellent program I am forwarding it to other people. Thanks a lot! Excellent Arte! I watched all of the videos and am going to watch them again. Great video, thanks for posting it. What does Arte says at 3:40 when he talks about the policies? I hear “The CHOOSE about your business”. If you can clarify for me, thanks in advance.